I was raised as being irreligious (in German “ohne Konfession” (literally: “without confession” or “ohne Bekenntnis”)) and this fact was noted as such in my official report card. Religious or ethical education was and is obligatory in Bavaria, where I went to school. In one of the bavarian grammar schools, which I had attended back then in the seventies, there were not enough irreligious or non-christian pupils for offering ethics lessons. So we 1 or 2 “irreligious” pupils were supposed to wait outside during religious lessons. The school was situated in a newly urbanized but still quite rural area, the catholic church was traditionally across the school yard and the priest himself was teaching religious education. I think there was a crucifix in every class room. This seems to be forbidden since 1995. Apart from the school report my irreligiousity could in principle have gone completely unnoticed since the kids were seperated into protestants and catholics for the lessons and each part of kids could have thought I am in the respective other lesson. My irreligiousity however didn’t go unnoticed and it was quite thematized by my peers. In particular even if I would have wanted to shed the fact of me being irreligous that wouldn’t have been easily possible – last but not least because of my handicraft teacher Mrs. Ringsquandl. For the handicraft lessons girl and boys were separated. The boys got to learn sawing and hammering, the girls got to learn needle work. Mrs. Ringsquandl was rather religious. So for example before each handicraft lesson the girls had to stand up with their faces towards the crucifix, which was hanging above the door of the school room and they were supposed to speak the Lord’s prayer in unison. I was irreligious so I kept sitting and kept silent, but I felt rather uneasy with everybody standing and partially staring at me. But since my father had already quite some trouble with insisting that I mustn’t receive religious lessons I also didn’t complain to my parents (I recall a scene where the priest and my father were shouting at each other in the middle of the school yard in a way that I was afraid they would enter into a fist fight). But alone this weekly routine during handicraft lessons made the kids constantly asking me why I don’t believe in god and wether I am not afraid that I am a sinner and wether I am not afraid that god won’t protect me. Some of the remarks went into the direction of taunts (“If you don’t in believe in god you are no good.”) . At that age you rather very much believe what your parents and other auhorities say. The fact that even some teachers were in clear disapproval of me being irreligious made me quite into an “outsider”. It was not that I had just another opinion, but that I did something which was sort of “unlawful”. I felt it made me even more an outsider than speaking with a slight Berlin dialect. Apart from that Mrs. Ringsquandls actions made it difficult for me to see my grades in handicraft lessons with a neutral eye. I told this little episode from bavarian grammar school because it illustrates some of the problems which occur if official authority figures display and use religious symbols in an official context. An authority figure which isn’t able to dispense with some of her or his religious actions (like wearing a certain religious symbol) won’t automatically be perceived as neutral and won’t automatically be perceived as being capable to treat someone with no or a different religion with due neutrality as e.g. demanded by the german constitution. Note also that its not the fact that a person wears a religious symbol which may here be a problem, but the fact that an official authority figure wears a symbol and in particular that the figure may not be able to refrain from doing so. In an order published today, the First Senate of the Federal Constitutional Court has decided that a general prohibition, incumbent on teachers in state schools, of expressing religious beliefs by outer appearance, is not compatible with their freedom of faith and their freedom to profess a belief (Art. 4 secs. 1 and 2 of the Basic Law, Grundgesetz – GG). …it is not sufficient that the expression of religious beliefs by outer appearance or conduct constitutes an abstract danger, it has to constitute a sufficiently specific danger of impairing the peace at school or the state’s duty of neutrality. The decisive statements in the Federal Constitutional Court’s crucifix decision were not applicable to the present case. Whereas that case concerned a religious symbol that the school, as a state institution, was responsible for installing, in this case the complainant, as a subject of fundamental rights, had suffered an encroachment upon her right to freedom of faith. In the case of fundamental rights that were unconditionally guaranteed, a restriction of the exercise of the right could be considered only in cases of specific endangerment. There was no such endangerment; there was no evidence of the alleged suggestive effect of the headscarf and the alleged possibility of a detrimental psychological effect. When the complainant had done teaching practice, there had been no conflicts or serious difficulties. The endangerments set out by the appointing body were merely of an abstract and theoretical nature. In this context I ask myself wether Mrs. Ringsquandl’s religious intervention would have counted as a “specific danger of impairing the peace at school” or as “merely of an abstract and theoretical nature” as I was of course keeping perfectly silent about the taunts and the Lord’s prayer etc. – for obvious reasons. Berlin senator Dilek Kolat wrote a commentary in Berliner Zeitung (in german) where she expressed similarily concerns that the judgement may eventually not be very helpful in finding balanced solutions. Und da fangen die Probleme an: Wie soll das im Alltag entschieden werden? Wann genau sind der Schulfrieden oder die Neutralität der Schule gefährdet? Müssen handfeste religiöse Konflikte vorliegen? Ich fürchte, dass bereits die Debatte darüber den Schulfrieden stören könnte. And there the problems start: How should that be decided in the daily routine? When exactly is the peace in school or the neutrality of the school endangered? Do there have to be stoutly conflicts? I fear that already the debate about that might disturb school peace. What to do to defang the discussion? Headscarfs are useful against cold etc. and I wore and wear them actually not too rarely. They are a beautiful fashion items. For those who wonder – I am still a non-atheist irreligious and up to now I had no problems if I was irraneously considered to be a muslim due to the headscarf or due to my burkini-kind of swimdress which I wear if I want to avoid sunscreen lotion and I hope that also in the future I don’t need to wear a headscarf with the sign “I am wearing a headscarf without being a muslim” on it. Would it help to see headscarfs more often in a non-muslim context? You called yourself a non-atheist. And you seem to be no scientist anymore. Do you think that the fact that you are no atheist played a role in your career path? A muslim women got 8600 Euro recompensation because she wasn’t hired as a Berlin school teacher. Reason for not hiring: She was insisting to wear her headscarf in school. I think Berlin should keep it’s neutrality law which basically says that teachers, police officers and and juridicial persons mustn’t wear religious symbols. I am not a lawyer, but as far as I can tell the neutrality law is not in conflict with the supreme court judgement. That is as far as I know the law (I don’t have the time to look it up) says that it is possible to make exceptions, i.e. by experience it is known that on average in certain contexts wearing a religious symbol constitutes a sufficiently specific danger of impairing the peace at school or the state’s duty of neutrality but in specific exceptions there might be no such danger, so for these cases headscarfs are allowed. By the way by reading the article it was not clear to me in how far the woman wasn’t hired because of her bad grades and not because of her headscarf, she had an average of 3.3, which -as the newspaper politely writes- is “not optimal.” I have my problems with grades, especially with grades issued in Berlin schools, but at some point one should notice that there seems to be rather an incompatibility of her and the Berlin school system not only because of the headscarf. Moreover it is also written that she refused to wear a wig instead of a headscarf for religious reasons. I.e. she wasn’t able to refrain from wearing a religious symbol, which I -as described above- consider very problematic. So in short given the information I have from the newspaper I am not happy about that Berlin courts judgement. I think it rather polarizes than that it furthers the peaceful cooperation. 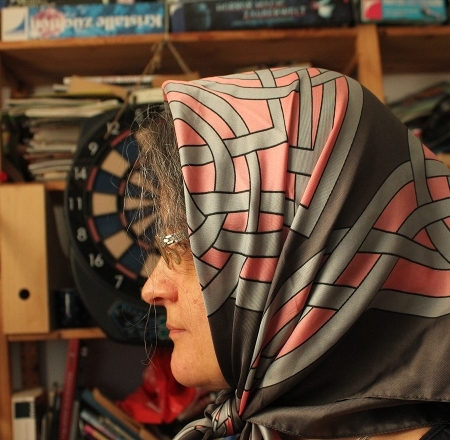 In particular it should also remarked that meanwhile some people try to make headscarfs into a political symbol. „Ich will den Beratungen nicht vorgreifen, gehe aber davon aus, dass das Berliner Neutralitätsgesetz nicht mehr zu halten sein wird“, sagte er. This seems to me a question of interpretation and language. § 2 Satz 1 findet keine Anwendung auf die beruflichen Schulen im Sinne von § 17 Abs. 3 Satz 1 Nr. 3 des Schulgesetzes sowie auf Einrichtungen des Zweiten Bildungswegs im Sinne von § 17 Abs. 3 Satz 1 Nr. 5 des Schulgesetzes. Die oberste Dienstbehörde kann für weitere Schularten oder für Schulen besonderer pädagogischer Prägung Ausnahmen zulassen, wenn dadurch die weltanschaulich-religiöse Neutralität der öffentlichen Schulen gegenüber Schülerinnen und Schülern nicht in Frage gestellt und (damit) der Schulfrieden nicht gefährdet oder gestört wird. So in short the law implies that wearing religious symbols is on average questioning the neutrality of the school vs. their pupils with respect to (religious) weltanschauung (“world-view”) and (thus) disturbing the peace at school but that there can be exceptions and if one can proof that in a certain case wearing a headscarf is not questioning the neutrality of the school vs. their pupils with respect to (religious) weltanschauung (“world-view”) and (thus) disturbing the peace at school then exceptions are possible. I think this is in accordance with the suppreme court judgement. The crucial point is in some sense that the suppreme court judgement didn’t state clearly what’s the rule and what’s the exception and in particular what happens if one assesses an average danger of peace detraction, which is definetely not the same as an abstract danger (suppreme court), but which is also not a specific danger. That is what I think is also what Dilek Kolat was mainly unhappy with. In Berlin one had made the experience that giving up neutrality as a rule leads on average to more quarrels and that is rather clearly stated in the Berlin neutrality law. I would like to emphasize again that I am not entitled to give legal advice, so the above is just my opinion. For those who wonder – I am still a non-atheist irreligious and up to now I had no problems if I was irraneously considered to be a muslim due to the headscarf or due to my burkini-kind of swimdress which I wear if I want to avoid sunscreen lotion and I hope that also in the future I don’t need to wear a headscarf with the sign “I am wearing a headscarf without being a muslim” on it. Isn’t non-atheist irreligious basically the same as agnostic?